Receiving a thorough diagnosis from master pulse reader Dr Smita Naram. Credit Ayushakti Clinic. I first learned about Ayurveda — India’s ancient, holistic system of medicine — at a weekend seminar sponsored by Chicken Soup for the Soul’s Mark Victor Hansen. The speakers were was Drs. Pankaj and Smita Naram, founders of the Ayushakti Clinic in Mumbai. It was an eye-opening presentation, and I arranged to go to his center for a 5-week detoxification regimen known as Panchakarma (literally, “five acts” of cleansing). It turned out to be a transformational experience. After the main purge, it was like being reborn: a sensation of electric energy woke me in the middle of the night and sent me to the mirror, where I beheld that my eyes had a radiant brightness; for days thereafter, my mood was elevated, I had new-found energy, and other people remarked that I was visibly glowing with health. About 10 days later, the end results spoke for themselves: I was off my oral medications for both diabetes and cholesterol, I had lost 22 pounds and never felt better. I also learned a great deal about, Ayurveda (literally, “life knowledge”), whose principles date back to the Bronze Age. I observed the marvel of accurate diagnosis by pulse reading, an art practiced throughout the Orient, yet mastered by few — including Dr. Smita Naram, who runs Ayushakti. The classic Ayurvedic treatment shirodhara: warm medicated oil dripping on the “third eye.” Credit Ayushakti Clinic..
Ayurveda prescribes herbal medicines that, while effective, carry none of the side effects that we are constantly warned about in allopathic (Western) medicine. At Ayushakti, rather uniquely these days, patients with acute and chronic illnesses alike are also treated with marma, the technique of pressure point medicine. Pulse diagnosis and marma were techniques that spread throughout Asia along with the expansion of Buddhism, which, of course, also originated in India; in China, marma became acupuncture. At Ayushakti, I observed as marma cured a young boy’s tonsilitis in minutes, sparing him unnecessary surgery. On another occasion, marma lowered a woman’s blood pressure 50 points in half an hour. Following my success with Panchakarma at Ayushakti, under the expert guidance of detox specialist Dr Rajeshri Mehta, I tried to maintain my regained level of good health by adhering to an Ayurvedic diet and taking herbal medicines I had brought back with me. I did OK for a couple of months; but the temptations of Western abundance being what they are, my diet was the first to fall victim to the lure of forbidden foods. Two years later, I was ready for another round of Panchakarma. In spite of the excellent results at Ayushakti, the traveler in me wanted a different experience. In particular, I wanted to try an “traditional” experience in the cradle of Ayurveda, the beautiful southern state of Kerala. I did indeed experience first-hand the traditions of southern Indian Ayurveda: the insistence on taking liquid medicines instead of Ayushakti’s tablets, and the use of traditional wooden treatment tables (where medicated oils are massaged into the body). Unfortunately, the doses of liquid medicine are very bitter; and the wooden treatment tables, while beautiful, lack the comfortable padding of Ayushakti’s adoption of modern amenities. Heart dhara, for a healthy heart and circulatory system. Credit Ayushakti Clinic. My second encounter with Panchakarma yielded mixed results. The weight loss was more than satisfactory, and the blood work revealed undeniable improvements in the lab test results, both for glucose and lipids. But I had been spoiled by my first experience: there was no feeling of being “born again.” I would come to learn that is a once-in-a-lifetime occurrence — the result of getting rid of more than 50 years of accumulated toxins in one month. I was not going to allow toxins to get this kind of foothold again. Therefore, after another two years, I was off to AVP, chosen by both the U.S. National Institutes of Health (NIH) and the World Health Organization as their center for collaboration in evaluating Ayurveda as an effective “alternative” or “complementary” system of medicine. (In other words, the West sees Ayurveda as something at least worth checking out; ophthalmology in particular is a field being investigated, as Ayurvedia has a proven track record in ameliorating macular degeneration). While Ayushakti has only eight in-patient rooms, AVP has more than 100, with accommodations ranging from entire villas, to suites, to single and double rooms and even wards. My encounters with patients from all over the world did much to reinforce my confidence in Ayurveda. There, for example, I met Krishna, a stroke victim who had checked in a month previously, after six months of frustrating physical therapy that had still left him shuffling his feet, with a dangling left arm that would not bend and a hand whose fist would not unclench. Now, in mere weeks, he was able to climb stairs lifting his feet high, the fingers of his hand splayed normally. His is one of literally dozens of success stories I got to know during my stay — then, and during two subsequent return visits to AVP over the following years. The cumulative effect of repeated, periodic detoxes eventually manifested itself; for most of my life, I was a classic example of yo-yo syndrome: I would lose significant amounts of weight, then gain it all back, and repeat the cycle. After five rounds of Panchakarma, however, my body’s metabolism was actually reset: I might put on a few pounds, but I no longer balloon back to unacceptable levels. Naturally, I never forgot my initial, transformative experience, and I recommended Ayushakti to a friend who’d had a conference in Mumbai canceled, and was loath to lose her non-refundable ticket. I suggested she check out Ayushakti; while I warned her not to expect results in eight days, I thought she would enjoy the treatments, be impressed by the pulse reading, and might want to return. Marma treatment for high blood pressure. Credit Ayushakti Clinic. My return to Ayushakti blew me away, even given my history with them. On my first visit, Dr. Smita Naram had read my pulse and diagnosed my Type II diabetes; this time, she went one better: with just one finger on my pulse, she told me my blood sugar level was between 7 and 8; indeed, my most recent Hemoglobin A1C score — tested in a lab — was 7.2! Fortunately, her diagnosis was not only about illness. Out of the blue, she also pronounced my immune system — ojas, in Ayurvedic terminology, a key parameter of health — in excellent shape. I took this as welcome validation of my practice of chi gong and tai chi — more examples of medical wisdom from the East, whose benefits have been documented by scientific research. One particular treatment really brought home the before-and-after effect of the bowel purge. Among the other ways toxins are expelled from the body is through the skin — by inducing perspiration, in a “steam bath.” For two days, sweat barely oozed out of my pores, even after 15 minutes of steam heat; yet the day after my primary cleanse, after barely one minute in the box, rivers of sweat literally flooded out of my body. The icing on the cake for me this time, however, was specialized marma treatment for a particularly pesky and sensitive matter. At home, I had been cautioned that I was at risk for an incipient hernia, and advised to have pre-emptive surgery. I recalled that marma could possibly be an alternative to hernia surgery, and inquired about it again. Long story short: I had three treatments administered by Ayushati’s Dr. Hemang Parekh, and felt immediate relief; being able to avoid surgery — and a hospital stay — made the entire trip to India worthwhile in and of itself. 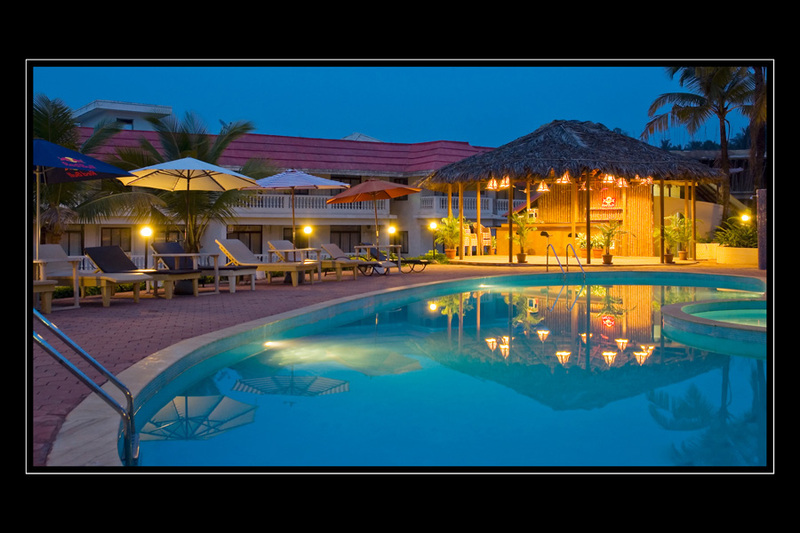 Ayushakti’s Ayurveda resort in Goa. Credit Ayushakti Clinic. The Hindu god of healing — Dhanvantari — is depicted holding several modes of treatment: a vessel containing elixir, and a leech — for bloodletting. Dr. Mehta did not employ leeches, but she did draw blood from my arm, then walked me over to the washroom and squirted my blood out of the syringe and into the sink. There I watched in amazement as my blood separated in front of my eyes, into two components: one red, and the other a rusty brown. “There is your aam,” Dr. Mehta told me, pointing to the contaminated blood, referring to the toxins that had been coursing through my bloodstream. When you can see your detox as well as feel it, you know you’re healthier than you were just days earlier. Readers of Everett Potter’s Travel Report are entitled to a discounted stay and treatments at Ayushakti in Mumbai. For further details, or any questions, please contact Buzzy Gordon at buzzygo@gmail.com. For more photos, see Instagram @buzzygordon. 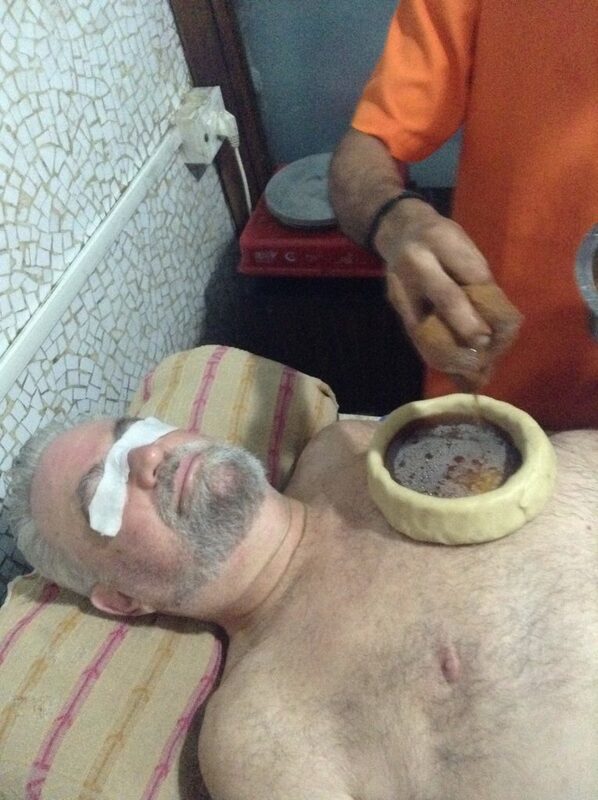 The classic Ayurvedic treatment shirodhara: warm medicated oil dripping on the "third eye"